t w e n t y - s o m e t h i n g .: Giveaway: Win a $30 Four Seasons Accessories Gift Card (2 Winners)! 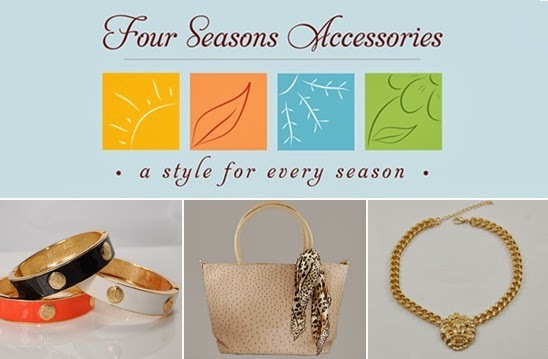 Giveaway: Win a $30 Four Seasons Accessories Gift Card (2 Winners)! Ladies, I'm excited to announce this giveaway to you! Mainly because the brains behind our newest sponsor is a mother-daughter duo. Tasha (the daughter), who has an awesome name I might add, had a dream to build an online boutique for women looking to purchase affordable, quality, trendy accessories for a fraction of designer prices. Knowing Crystal (the mother) had years of professional retail experience, they opened Four Seasons Accessories together in May! The boutique has reached so much success in only a few months. Their secret is cutting out the middle men and doing business directly with the best vendors. This means lower prices and handpicked pieces for their clients. Tasha and Crystal have generously offered twenty-something blog readers the chance to win a $30 Gift Card... just in time for the MAJOR holiday shopping season! Follow the simple steps below via Rafflecopter. Please be honest. All entries will be verified. I personally have a little shopper's crush on the Four Seasons handbag collection: The Camel Cohen Tote, the Khaki Ostrich Tote and the Green Clutch Handbag are all on my Christmas wishlist! I'm certain you'll feel the same way, once you visit the Four Seasons Accessories online boutique. Here's a treat: Enter code FSATWENTY% at checkout to receive 20% OFF your entire purchase. Tres-Chic Thursday + WIWW + What I Wore Wednesday + Trend Spin. FTC Disclaimer: Four Seasons Accessories will supply $30 gift cards to two readers for this giveaway. The opinions expressed in this post are my own. If I win I will buy the long white beaded necklace and the crystal clear studs! I might get the in full bloom necklace! I love hearing feedback from my fabulous readers! Thank you for stopping by! Click Here if you are interested in collaborating with twenty-something! Let's Shop Small on Saturday! Disclosure: This site contains affiliate links. Clicking on or purchasing from those links may result in commissions for this site. © Copyright 2010 - 2015 twenty-something blog | All rights reserved. Powered by Blogger.